DQ was junior bridesmaid in Uncle W and Aunt E's wedding last year. She looked so beautiful and like such a big girl. She looks like a girl who is well-loved and feels secure that she is treasured. Love it! I want a girl! wanna trade for a summer or something? wow shes a beauty-that pic is awesome! Gorgeous picture! 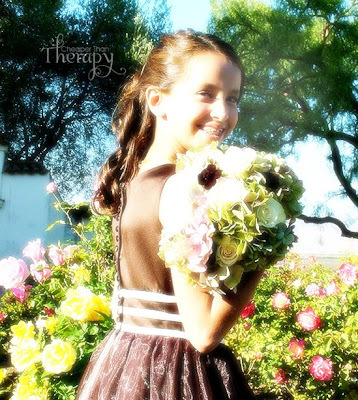 It is so funny...Alissa, who just turned 10, was in my brother's wedding last year. They look so similar. Their hair is identical. Wow. Aren't they so pretty dressed up like that? Thats a gorgeous picture! 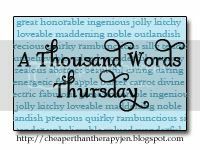 I just LUV A thousand words Thursdays! Pssst...check mine out..it is TOO cute!!! I posted on "Vent Space". Wow that is a beautiful picture, you need to 8x10 that and ang it up! She's beautiful! What a great picture! I'm still in the dark about this button grabbing business. Sorry. I just wanted to say what a gorgeous gorgeous picture of your daughter! Every single time you post pictures, I am blown away by how beautiful your children are!!!! Awww, such a great photo! Love those flowers! I sware, your missing your calling as a photographer! Forget Sears, if you lived closer I would so beg you to take some pictures of my children! she's beautiful and wow, that dress is gorgeous! Oh Jen, she looks beautiful!! Wow - isn't it amazing how grown up they look when they are all dolled up!?!?! Makes me think of my girl in my brother's wedding. She looks so beatuiful and so grown up! what a gorgeous shot. Giiiiirl, you are great with a camera! What a gift. What a little beauty you have! Now she is so-o pretty! The flowers just add that extra something for a beautiful shot! You are such a talented photographer! She's more beautiful than the flowers she's holding. I love how the light is shining on her. GORGEOUS! She look so good in brown! The flowers are so purty! OMG, she looks absolutely stunning! Wow!! She looks beautiful!!! Thanks for sharing!! Very beautiful. Looks like she had lots of fun. That is an INCREDIBLE picture of her! She is drop-dead gorgeous, just like mama!!!! OH. MY. GOSH. She is gorgeous! And what a stunning dress! How come the dresses I have had to wear never looked like THAT??? I have a question for you...how did you do your blog overlay on the photos? I do a lot of photography and I'm sure some of the pics will be snagged. I'd LOVE to know how to do the overlay if you would be willing to share that with me. Thanks so much. With gratitude, Laurie B.
I don't know exactly the rules of this meme... Could anyone tell me how it works, please?